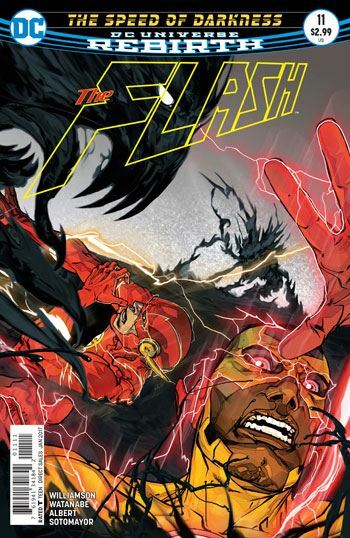 In this issue of the Flash we get to see the Shade looking far more familiar than in the previous issue. That’s a darn good thing. By coincidence or design, the Flash tv series introduced their version of the Shade last week, and it was very disappointing. Joshua Williamson brings back the beloved character we know in this book. Still, not everything is rosy and light, not by a long shot. Barry Allen and Iris West are not happy at all when they discover that Wally has continued to sneak out and play Kid Flash, despite their grounding of him. 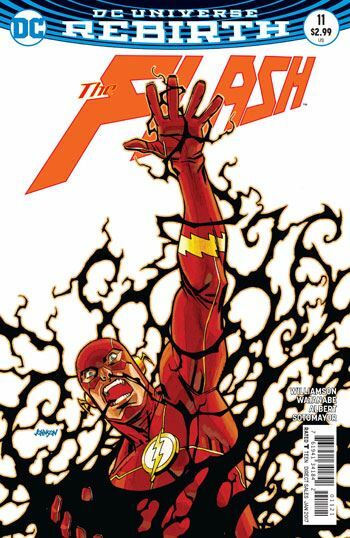 Barry switches to the Flash, and hunts out his junior partner, who has been transported to the Shadowlands by the Shade. Once the Flash reaches the Shadowlands, and Wally, he sees the Shade looking far more dapper and in control than the character had appeared in the previous issue. The Shade is still talking about the loss of hope, but I failed to pick up on the wonderful clue that was. Not hope. But Hope. Hope O’Dare, the policewoman the Shade had fallen in love with during his tenure in Starman. It turns out that while the Shade really intended to live happily ever after with his new love, the thirst for the criminal life was too much for him to give up. The shadows that the Shade had controlled for so long began to take a life of their own, and took Hope away from him. The shadows also grab Iris West, and by the end of the issue Williamson has laid the groundwork for what looks to be an exciting battle in the following issue.